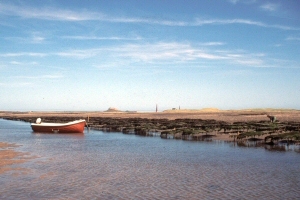 The Lindisfarne Oyster Farm, which is part of Ross Farm, connects back to the year 1381 when the monks of Lindisfarne Priory on Holy Island paid 100 shillings to a Scotsman for a boat filled with oysters. This transaction was recorded in the 'History and Antiquities of North Durham' written by the Rev James Raine in 1852, so it is over 600 years since the start of the oyster beds here on the Northumbrian coast. The 1881 Census shows Thomas Bowey, oysterman, living with his family in a cottage on The Old Law, adjacent to the oyster beds. Thomas was an employee of Lord Tankerville of the Chillingham Estate, who was the owner at that time. In 1989, we noticed oyster shells at low tide and decided to start production again. It is still a small family business, now run by Christopher and Helen Sutherland. The production is carefully monitored by the local Health Authority, and the oysters, whose growth comes entirely from what they extract directly from this cool North Sea seawater, are considered to be of the very finest quality by the connoisseur. Lindisfarne Oysters are delivered throughout the UK, but are also available directly on-site if ordered in advance.